NMDA receptors are traditionally known to function as post-synaptic coincidence detectors. Interestingly, NMDARs are also found presynaptically, where they control synaptic release. Since NMDARs need to be post-synaptically located to act as coincidence detectors, these preNMDARs must serve a different function. Their location on the presynaptic side places preNMDARs in the perfect position to provide feedback modulation of release. Consistent with this, preNMDARs are selectively activated by high frequency activity (Buchanan et al., 2012), thereby acting as an auto-detector for particular activity patterns. In contrast to this frequency-dependence of preNMDAR activation in evoked transmission, preNMDARs also enhance spontaneous release, which are typically recorded under conditions with blockade of all action potential activity in the slice. This suggests that preNMDARs control spontaneous and evoked release via different mechanisms, although exactly how was unknown. 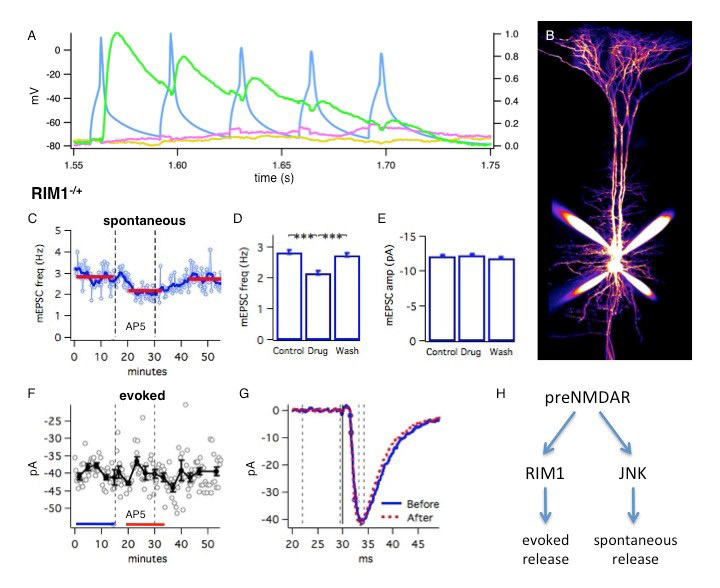 Using quadruple whole-cell recordings from acute slices, we found that preNMDARs required RIM1 to modulate evoked release, while signaling through the c-Jun N-terminal kinase (JNK) pathway was essential for preNMDAR-mediated enhancement of spontaneous release. This is consistent with observations that spontaneous and evoked release can be differentially affected by the same manipulation (Xu et al., 2009; Lien et al., 2006; Glitsch and Marty, 1999). More specifically, our findings provide additional evidence in support of the view that spontaneous and evoked transmission function through different mechanisms (Jackman et al., 2016), possibly acting on different pools of vesicles (Ramirez et al., 2012). In addition, by mapping the exact mechanisms of preNMDAR function, we further establish the role of preNMDARs in regulating vesicular release. RIM1 is a presynaptic scaffolding protein important for plasticity and maintenance of the readily releasable pool (Calakos et al., 2005). Previous work in the lab has shown that in layer 5 of the developing mouse visual cortex, RIM1 proteins are required for the effects of preNMDARs on evoked release. In RIM1 heterozygous and homozygous knock out animals, we found no decrease in evoked release with preNMDAR blockade, whereas there was a significant decrease in controls. Thus preNMDARs require both copies of RIM1 in order to modulate evoked transmission. We set out to investigate whether preNMDARs also enhance spontaneous release in a RIM1-dependent manner. In whole cell patch recordings, pyramidal cells (PCs) were hyperpolarized to -90mV in order to block post-synaptic NMDARs. Spontaneous mini excitatory post-synaptic currents (mEPSCs) were recorded from individual cells held in voltage clamp, detected offline using custom software (e.g. Fig. 1C), and compared between baseline and wash-in of the NMDAR antagonist AP5 (e.g. Fig. 1D,E). Surprisingly, I found that RIM1 was entirely dispensable for preNMDAR-mediated enhancement of spontaneous release. In RIM1 heterozygous as well as homozygous knock out animals, preNMDAR blockade still reduced spontaneous activity, as in controls. This demonstrates that spontaneous and evoked release can be independently modulated, and specifically, that preNMDARs act via different mechanisms to control spontaneous and evoked transmission. To further probe this dissociation between preNMDAR control of spontaneous and evoked release, I used paired recordings of connected PCs in heterozygous RIM1 knock out animals. Pairs of connected neurons were found by evoking action potentials in one cell and looking at responses in the other cells, averaged across trials (Fig. 1A). Once a connection was found, the presynaptic cell (corresponding to the blue channel in Fig. 1A) was held in current clamp, with regular current injections to evoke action potentials while the responses to those action potentials in the post-synaptic (green channel) cell was recorded along with spontaneous events recorded during the inter stimulus periods for the evoked response. I found that in the same post-synaptic cells, under exactly the same recording conditions, NMDAR blockade reduced the frequency of spontaneous activity (Fig. 1C) but not the amplitude of concurrently recorded evoked activity (Fig. 1F). Therefore, preNMDARs require RIM1 to regulate evoked but not spontaneous release. The natural follow-up question was then how preNMDARs enhance spontaneous release. In layer 2 PCs of the mouse entorhinal cortex, preNMDARs regulation of spontaneous release is dependent on JNK signaling (Nisticò et al., 2015). To determine whether preNMDARs in layer 5 PCs of the visual cortex also regulate spontaneous release through JNK signaling, I incubated slices with the JNK inhibitor SP600125 (Bennett et al., 2001) before conducting mEPSC recordings with AP5 wash-in as before. Following incubation with SP600125, I found no effect on mEPSC frequency from preNMDAR blockade. This demonstrates that the JNK pathway is necessary for preNMDAR-mediated enhancement of spontaneous release. Additionally, more recent experiments indicated that inhibition of JNK signaling had no effect on preNMDAR regulation of evoked release. Therefore, mirroring the RIM1 dissociation of spontaneous and evoked release, preNMDARs require JNK signaling to regulate spontaneous but not evoked release. We propose that preNMDARs act upstream of RIM1 and JNK to independently modulate release (Fig. 1F), although the evidence for this ordering was not presented here. We have found that the effects of preNMDARs on spontaneous and evoked release are independent and furthermore identified doubly dissociated mechanisms of preNMDAR action. This is consistent with the observation that preNMDARs selectively enhance high-frequency evoked transmission; yet tonically promote spontaneous release under mEPSC recording conditions with no action potential activity. Interestingly, both copies of RIM1 are required for preNMDAR-mediated enhancement of evoked release during high-frequency activity, while RIM1 expression is dispensable for preNMDAR modulation of spontaneous release. In contrast, inhibition of JNK signaling abolishes preNMDAR modulation of spontaneous but not evoked release. Therefore preNMDARs independently modulate evoked release through RIM1, and spontaneous release in a JNK-dependent manner. At the synaptic physiology level, our results demonstrate that spontaneous and evoked release are modulated by separable mechanisms. In addition, by mapping the exact molecular basis of preNMDAR function we further prove the existence of preNMDARs, which had been contentious (Christie and Jahr, 2008, 2009). At the systems and circuit level, we characterized the basis for an activity-dependent, self-regulatory mechanism for sustaining high frequency activity. Figure 1: Presynaptic NMDA receptors control evoked but not spontaneous release via RIM1αβ. (A) Sample quadruple whole cell recording of a connected pair of pyramidal neurons: membrane potentials averaged over ten sweeps show that action potentials elicited in the presynaptic (blue) neuron elicits EPSPs in the postsynaptic (green) neuron. (B) 2-photon imaging of pyramidal cells filled with a fluorescent morphological dye during recordings. (C-G) Sample experiment with spontaneous and evoked activity recorded simultaneously in the same cell, from a RIM1 heterozygous knock out animal. (C-D) Frequency of spontaneous mEPSCs decreases with blockade of NMDARs from AP5 wash-in. (E) AP5 wash-in had no significant effects on the amplitude of spontaneous mEPSCs. (F-G) AP5 wash-in had no effect on the amplitude of evoked activity. (H) Schematic for preNMDAR modulation of spontaneous and evoked release. Bennett BL, Sasaki DT, Murray BW, O'Leary EC, Sakata ST, Xu W, Leisten JC, Motiwala A, Pierce S, Satoh Y, Bhagwat SS, Manning AM, Anderson DW (2001) SP600125, an anthrapyrazolone inhibitor of Jun N-terminal kinase. PNAS 98(24):13681-13686. Buchanan KA, Blackman AV, Moreau AW, Elgar D, Costa RP, Lalanne T, Jones AAT, Oyrer J, Sjöström PJ (2012) Target-specific expression of presynaptic NMDA receptors in neocortical microcircuits. Neuron 75:451-466. Calakos N, Schoch S, Südhof TC, Malenka RC (2004) Multiple roles for the active zone protein RIM1α in late stages of neurotransmitter release. Neuron 42:889-896. Christie JM, Jahr CE (2008) Dendritic NMDA receptors activate axonal calcium channels. Neuron 60:298-307. 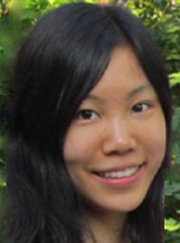 Christie JM, Jahr CE (2009) Selective expression of ligand-gated ion channels in L5 pyramidal cell axons. J Neurosci 29(37):11441–11450. Glitsch M, Marty A (1999) Presynaptic effects of NMDA in cerebellar Purkinje cells and interneurons. J Neurosci 19(2):511-519. Jackman SL, Turecek J, Belinsky JE, Regehr WG (2016) The calcium sensor synaptotagmin 7 is required for synaptic facilitation. Nature 529(7584):88-91. Lien CC, Mu Y, Vargas-Caballero M, Poo M (2006) Visual stimuli-induced LTD of GABAergic synapses mediated by presynaptic NMDA receptors. Nat Neurosci 9(3):372-380. Nisticò R, Florenzano F, Mango D, Ferraina C, Grilli M, Di Prisco S, Nobili A, Saccucci S, D’Amelio M, Morbin M, Marchi M, Mercuri NB, Davis RJ, Pittaluga A, Feligioni M (2015) Presynaptic c-Jun N-terminal Kinase 2 regulates NMDA receptor-dependent glutamate release. Sci Rep 5:9035 DOI: 10.1038/srep09035. Ramirez DMO, Khvotchev M, Trauterman B, Kavalali ET (2012) Vti1a identifies a vesicle pool that preferentially recycles at rest and maintains spontaneous neurotransmission. Neuron 73:121-134. Xu J, Pang ZP, Shin OH, Südhof TC (2009) Synaptotagmin-1 functions as a Ca2+ sensor for spontaneous release. Nat Neurosci 12(6): 759-766.